transpose is a new work for the window space gallery at the ISE Cultural Foundation in Soho, NY, which is also opened on next Friday 9/10. I finally tested it out the system with real equipment/setup, which works great. Then, now, I want to tweak the visual effect a little bit more. It must be beautiful in some degree. 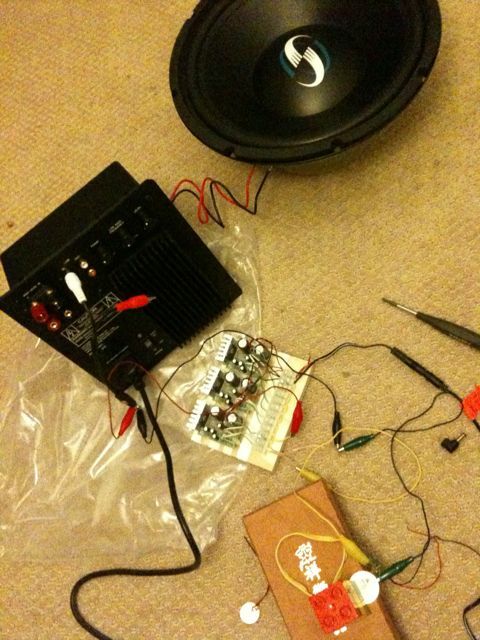 From top, 12″ subwoofer speaker, subwoofer amplifier, general amp (for mic amp this time), contact microphone (took apart one of the piezo speakers from RadioShack). This entry was posted in art, tech and tagged exhibition, sound, tech, transpose. Bookmark the permalink.